Spring is a wonderful time of year! I’m happy when my fingers are turning over soil, finding fat earthworms, planting seeds, and getting dirty. What a joy it is that just a few weeks later I am harvesting baby kale, lettuce, and radishes. Oh, I have a lot more than that growing this year, much to the delight of my sweet husband who helped me pile on loads of rich, 7 year organic compost over last years’ leaf and cardboard harvest. I have been called a “food snob” by some. I like my veggies and fruits to be organic and free of herbicides and pesticides, my meat to be pastured and not grain fed, and my vegetable seeds and feed for my chickens to be organic and Non Genetically Modified. What better way to know how your food is grown than to grow it yourself? I understand that not everyone has a green thumb or has the space to plant a garden. 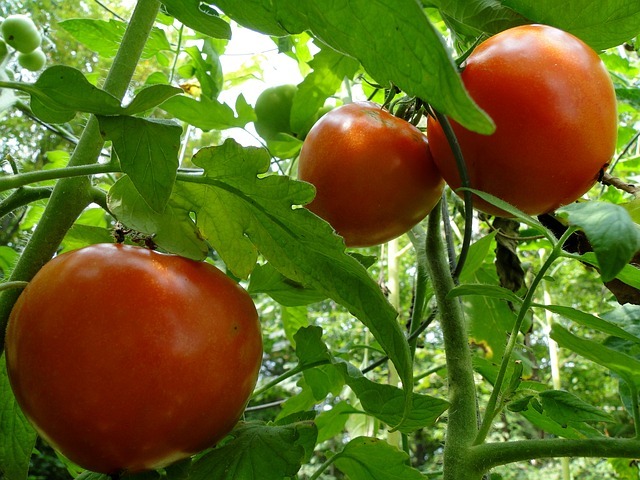 A tomato plant in a pot on the patio will yield some sweet fruit. You can plant just about anything in a pot. Be creative and get some dirt under your fingernails! The next best thing to having your own produce is a visit to your local farmers market. I have listed a few of the local markets below. Many of the vendors will not have an “organic” label, as the price to be a certified organic farmer is very expensive and cost prohibitive for the small farm. Do ask your market farmers how they grow their produce. Many will grow without pesticides and herbicides. The Environmental Working Group (www.ewg.org) publishes a list called “The Dirty Dozen and Clean Fifteen”. The following foods (Dirty Dozen) should be purchased organically if at all possible. The following foods (Clean Fifteen) can be purchased conventionally. The EWG also publishes guides to healthy cleaning, sunscreen, and water filters; lists of dirty dozen food additives, endocrine disruptors, and genetically engineered foods; and food scores where you can “Rate Your Plate”. Jenny Crabtree is an RN, Certified Integrative Nutrition Health Coach, and Certified Horticulturalist. Her passion is to help women achieve ultimate health through nutrition, diet, and lifestyle changes. Thanks Jenny, this is great information.